Follow us on facebook We suggest you like or follow our club's Larkey Private Swim Club FACEBOOK page for current pool announcements. Be good neighbors: No speeding through the local neighborhood. Drive slowly and stop at stop signs. Do not cut into the oncoming lane when turning onto Duxbury Court. No shouting or loud talking in the evening or night while walking to your car if parked outside the club parking lot. Be compassionate and mindful and behave how you would want a visitor to behave in your neighborhood. Parents, please convey this information to your children who are of driving age. Click on the icon. It prompts you​ to log in. U​se the main email we have on record for you. If you haven't already logged in before, click on 'Reset password' and set that up. Once you're logged in, click on the icon again and choose 'View profile' to view your information and make any changes by clicking on 'EDIT'. Make sure you 'SAVE' any changes. Snack and Guest cards. 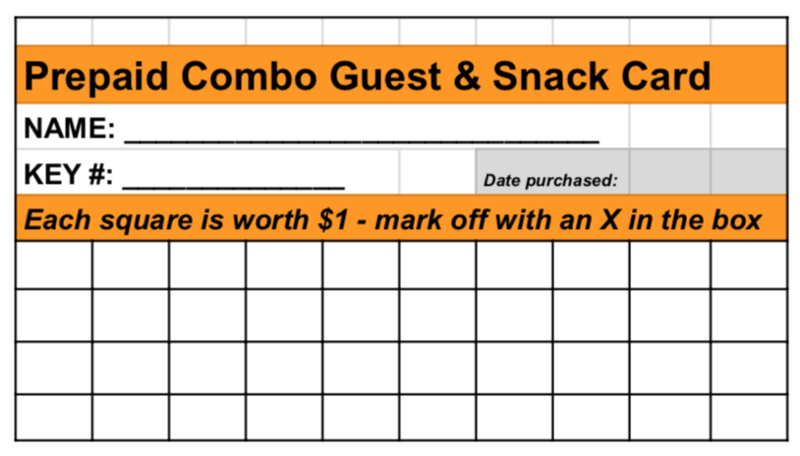 You can now buy your pre-paid combo snack & guest cards online (see below). You save 10% by purchasing the $40 value card for just $36. Gatekeepers will no longer be selling the cards. The pre-paid guest and snack card is kept at the gatekeeping desk under your member key # and a $1 box is checked off by the gatekeeper for your purchases (snack or guest). If you do not have a prepaid card on file, you will need to pay with cash or PayPal for individual purchases. As a Larkey Pool member, you are welcome to share the facility with your guests. Guest fees are $4 per person per day. Please remember though that you are ultimately responsible for the actions and behavior of your guests while they are at the pool. You must sign in your guests on the sign in on the daily sign-in sheet and indicate method the guest fee was paid. Failure to have the gatekeeper confirm payment method will result in receiving an invoice for guest charges considered not paid. Nanny Permit. 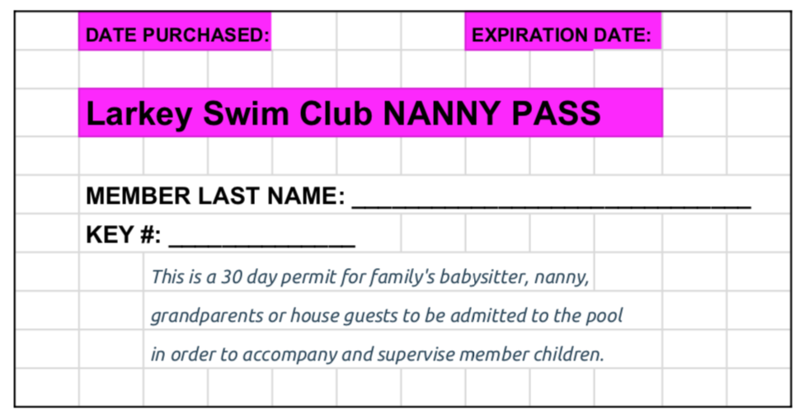 Any regular babysitter, nanny or grandparents/house guests who bring member children to the pool must purchase "Nanny" permit every 30 days online. The permit allows the babysitter, nanny or grandparents/house guests to be admitted to the pool. This fee must be paid for admission, even if the babysitter or grandparents do not swim in the pool. (NOTE: a permit is not needed for swim practice or swim lessons.) The babysitter, nanny or grandparent must sign in on the daily sign-in sheet and have gatekeeper check for the card in the MEMBERS CARDS BINDER and confirm on the member log-in sheet that there is a current card on file.